What Fun Games Do You Play With Your Dog? Now that the weather is starting to warm up, so we asked our Facebook fans, What kind of fun games are you playing with your dogs? Swimming, kiddie pools and hiking were among the top activities. Whatever we are doing, a day playing with our dogs is better than any day doing something else. Thanks everyone for sharing. Boating, Canoeing, and swimming! Anything with water to stay cool in the heat! 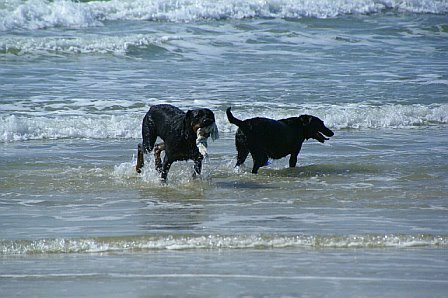 We play tag in the ocean….. I make then stay on the beach and then dive into the water as I give the command “follow”…. they try to catch me… It’s pretty funny, watching three dogs chasing a swimmer… I let them catch me after a bit… gotta reward them. Scent detection in the park! I take mine paddle boarding! Filling up the holes they dig in the backyard. Kiddie pool and sprinklers dogs and the kids love it. Baby pool time and camping! Oh, and a few trips to the Sno-Cone stand! My dog kayaks with me. My daughter is at the stage where it’s just “not cool” to go out with me anymore, so I’m thankful that Gus will! 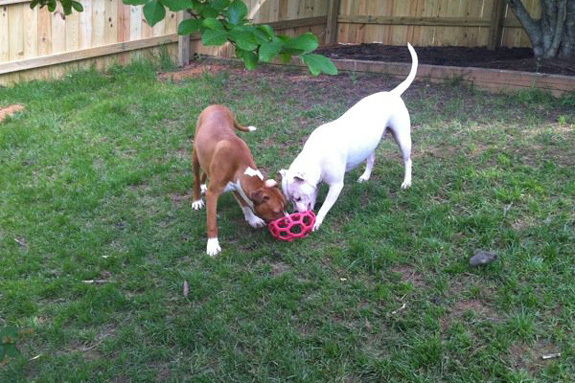 We play fetch, swimming and a lot of barbequing, Sasha and Krush are test tasting. Going to the park. I bought a big bag of dirt to fill in the holes my boy digs. The same silly stuff as any other day (Kong, Wubba, tennis ball, random zoomies) – but earlier and later in the day. We like frozen Kongs (sometimes we even freeze them with the treats inside), baby pool parties, ice cube treats, and sprinklers! 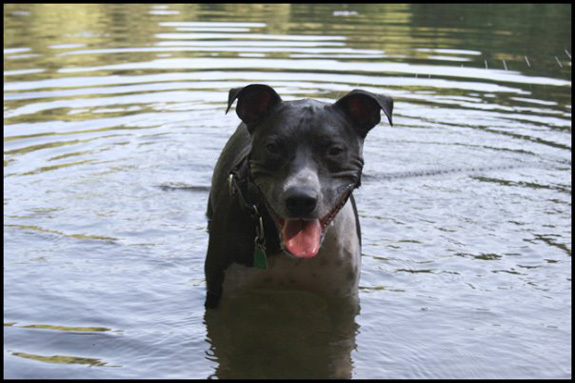 We live in a pretty warm area, so we head to the mountains where Bogart can cool off in streams and lakes. No swimming for this guy…once the water starts to lap against his chest, he won’t go in any further! Swimming and long walks in the woods! We do the usual… throwing the ball…Frisbee…sticks…playing in the house. I am NOT a morning person, so we take a daily walks in the evening after dinner or late at night. I don’t work in the summer, so we can “roams the streets” late at night. We fill our kiddie pool full of water. Then our Buster Brown digs out all of the water and drags the pool around the yard. It’s his version of a pool party. Bane likes to be chased around the yard by me carrying the laughing almost-toddler, and jumping through hula hoops! Swimming! 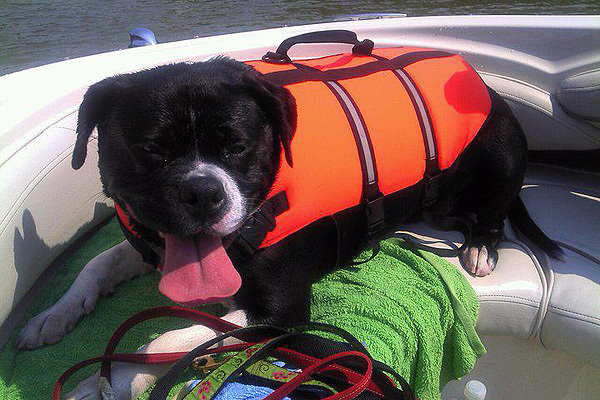 Our dog is healing from her second ACL surgery, but she can’t wait to get in the water again. Dodge loves to play in his kiddy pool or jump in the creek at the local nature trail, Storm wants to play fetch; and my elderbull Jaime and elder dachshund Copper just want to sunbathe! Parvo plays fetch (a fetching fool) and Daisy chases him. Playing fetch in the dark, what fun! Krush has gotten a lot bigger since the picture of him & Sasha playing with their red ball and the yard has more holes (thanks to Sir Krush). Everyone please be safe & have a MARVELOUS Memorial Day and remember to be thankful for what you have and why you have it. Thanks to ALL who have and continue to serve!